“China’s largest freshwater lake, Poyang, has shrunk by one third in the past three days due to reduced water supply from the Yangtze River and little rainfall,” reported the official Xinhua news agency. The lake’s surface area was reduced from 2,169 km² on Monday to 1,490 km² Wednesday (October 22) , a reduction of 679 km², reported the Jiangxi Provincial Hydrological Bureau. Limited water flow from the upper Yangtze River, due to the water being diverted to hydroelectric dams, and lack of rainfall in the province were two major causes for the loss, said the bureau. Jiangxi Province has received an average precipitation of less than 5 mm since September 20, said the report. The average area of the lake is about 3,500 in normal years. However, it shrank to about 200 due to drought and the practice of diverting water to the Three Gorges Dam in 2012. “Every year, when the Three Gorges reservoir stores water – to power the dam’s turbines during the winter – the flow rate in the Yangtze drops. This in turn increases the rate at which the level of Poyang lake falls, and the period of low water comes sooner,” said Ye Xuchun, a researcher at China’s Southwest University. Poyang Lake is a vital habitat for at least 236 species of birds including various endangered species, such as oriental white stork and white crane, and more than 100 species of wintering migrants, including Siberian cranes, according to a recent survey. Extreme Rain Events (EREs) continue to batter large parts of China, said the country’s National Meteorological Center. Rainstorms since June 18 have left dozens of people dead or missing, reported Xinhua. In Hunan Province alone, as of June 21, flooding had affected about 3 million people, leaving 171,000 homeless, at least seven dead and four missing across 10 cities and 47 counties, according to the civil affairs authority. “Jiangxi’s local bureau of civil affairs reported that at least five people had died across eight cities and 43 counties in the province as of 10 a.m. on Saturday. Downpours have swept the province since Wednesday,” said the report. About 789,000 people have so far been affected, and 123,000 relocated. “The rainstorms, which have caused the collapse of or substantial damage to 4,000 houses and affected 63,100 hectares of crops, have led to direct economic losses of 530 million yuan (84.85 million U.S. dollars) in Jiangxi,” Xinhua reported. Severe weather have affected at least 118,700 people, leaving 2,341 homeless and at least two dead, as of 3 p.m. Saturday, according to the regional civil affairs department. “Yellow Alerts” for rainstorm have been renewed for Hunan, Jiangxi, Anhui, Zhejiang, Fujian, Yunnan and Guangdong provinces, Guangxi Zhuang Autonomous Region and Tibet Autonomous Region, and Shanghai, said the National Meteorological Center warning that torrential rains were expected to continue. Millions of people are affected, more than 300,000 left homeless and dozens are dead or missing, as rainstorm continue to batter large swathes of central, east and southern China. In Hunan Province, flooding has affected about 3 million people, leaving about 171,000 homeless, at least seven dead and four missing across 10 cities and 47 counties, according to the civil affairs authority. “The rainstorms also caused severe damage to 9,700 houses and 122,700 hectares of crops, and direct economic losses of 1.57 billion yuan in the province,” said the report. More rain and flooding expected through at least Sunday, said local meteorologists. Typhoon SOULIK, the seventh typhoon to hit China this year, has affected at least 2 million, forcing 500,000 to evacuate, and leaving at least 20,000 displaced in south China’s Guangdong Province. SOULIK landed in Fujian province Saturday afternoon, and moved to Jiangxi province on Sunday. The typhoon brought torrential to Guangdong province. Local weather stations reported precipitation of more than 250mm (10 in) in 20 hours to 4 p.m. Sunday. SOULIK has affected at least 382,000 people in Guangdong province alone, destroying 1,076 houses in 80 townships in three cities of the province and leaving 3 dead, Xinhua reported. Torrential rains have further raised water in local rivers to above warning levels, the report said. At least 400 people have been killed and thousands more injured amid escalating violence in Iraq, between July 1 and 14, 2013. California Gov. Brown has declared a state of emergency in Los Angeles County for the so-called Powerhouse Fire. The declaration comes a month after the wildfire destroyed 53 structures, including 24 residences, and more than 47 square miles of brush. The fire began May 30 near a utility station and was contained on June 11. “Kelly Huston, deputy director of the California Emergency Management Agency, says the move is required before LA County can qualify for federal emergency highway funds to repair roadways damaged by the fire,” said a report. “According to UK newspaper, the Guardian, Snowden has only released part of the intelligence he has. During his revelations of the US surveillance program, Snowden says the US government and US communication companies are involved. Scorching drought in China’s western and central regions has affected at least 3.58 million hectares of farmland, [that’s an area the size of Taiwan,] drought relief authorities said. At least 5.54 million people and 3.99 million livestock in the two drought-stricken regions are currently short of drinking water, the report said. Extreme Rain Events have battered southern and eastern China since last week, destroying thousands of homes, and affecting at least a million people, said a report. As of Saturday, rainstorms have affected about 850,000 people, toppled more than 2,200 homes and forced 14,000 citizens to relocate in Hunan. Rainstorms have affected about 196,800 people in east China’s Jiangxi Province, local authorities said Saturday. As of 11 p.m. Friday, the heavy rain, which started from Tuesday, has battered 26 counties in Jiangxi, the provincial flood prevention and drought control headquarters said. The storms have destroyed about 20,000 hectares of crops, and left tens of thousands displaced. 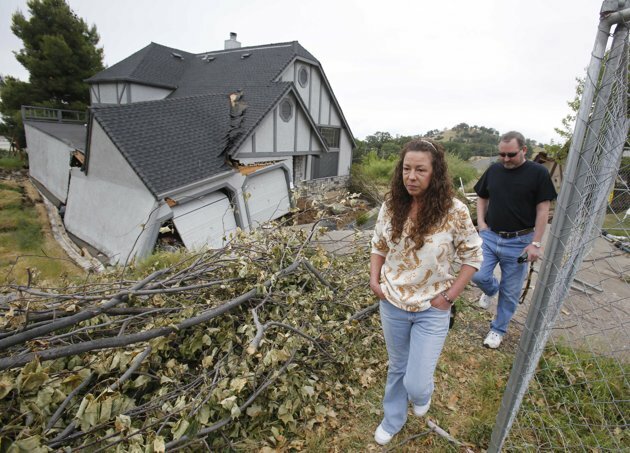 Homes in Lake County, about 100 miles north of San Francisco, are breaking apart and sinking into cavernous fractures that had first appeared as cracks in the ground. “We have a dormant volcano, and I’m certain a lot of things that happen here (in Lake County) are as a result of that, but we don’t know about that,” county public works director Scott De Leon told Yahoo News. At least 46 people were killed and 100 others injured, 50 of them seriously, after 3 powerful explosions shook the Turkish town of Reyhanli in the southern Turkish province of Hatay, near the border with Syria, authorities have said. Death toll from a coal mine explosion on Saturday in southwest China’s Sichuan Province rose to 27, local authorities said. The blast occurred in Taozigou colliery, Luxian County in the city of Luzhou, according to officials. Death toll from the collapse of the Rana Plaza garment factory complex in Bangladesh rose to 1,126 by 3:00pm ( local time) on Sunday, after 16 additional bodies were discovered in the rubble, 19 days after the building collapsed, officials said. Two more people have died from novel coronavirus (nCoV) in an outbreak in al-Ahsa region of Saudi Arabia, Reuters quoted a Saudi official as saying. The latest cluster of infections includes 15 confirmed cases, including 9 deaths, the official has reported. From April 2012 to [May 8, 2013,] a total of 33 people from Saudi Arabia [2 others reported dead on May 12,] Qatar, Jordan, the United Kingdom, the United Arab Emirates, and France were confirmed to have an infection caused by the novel coronavirus, CDC reported. Extreme rain events in the Chinese provinces of Hunan, Guizhou, Jiangxi and Sichuan, as well as the Guangxi Zhuang Autonomous Region, have triggered severe flooding and landslides, affecting thousands of towns and villages, disrupting the lives of tens of millions of people, leaving many dead or missing, and forcing hundreds of thousands to evacuate. The disasters have destroyed tens of thousands of homes, millions of hectares of crops and much of the infrastructures . Meantime, Germany’s leading daily newspaper, Frankfurter Allgemeine Zeitung reported the May 25 Houla massacre was perpetrated by opposition forces aligned with the Free Syrian Army (FSA). “The report refutes the official account by the United States and other major powers and presented uncritically by the media. The massacre was attributed to pro-government forces and used to step up the propaganda offensive for military intervention against the regime of Bashar al-Assad. Without providing any serious evidence, the US and its allies claimed that either the Syrian Army or pro-government Shabiha militas carried out the mass killing of over 100 people.” Said a report. Gaza. The water in Gaza is too contaminated to drink, says a joint report by the Medical Aid for Palestinians (MAP) and Save the Children. The report “Gaza’s Children: Falling Behind” describes the impact of the ongoing blockade on the lives and health of Gaza’s children. Gaza’s only fresh source of water is highly contaminated by fertilizer and human feces, the report says. The number of children being treated for diarrhea has doubled in 5 years, and the levels of nitrates found in the water are responsible for to the doubling since the blockade began, according to the report. The report will be launched on June 20, 2012 at the Royal College of Paediatrics and Child Health, London, UK. New Mexico. The Little Bear Fire located in Smokey Bear Ranger District, Lincoln National Forest, and the White Mountain Wilderness, has now grown to more than 26,000 acres (~ 41 sq miles; 105km²), destroying or damaging dozens of structures. Evacuations: All campgrounds west of Bonito Lake; subdivisions of Villa Madonna, Enchanted Forest, Nogal Canyon (Forest Road 400, campground and summer homes), Angus, Sierra Vista, Sontara (1,2 and 3), Rancho Ruidoso, Copper Canyon, and Loma Grande; Eagle Lakes Campground, Eagle Creek summer homes, Ski Run Road (State Highway 532) at mile marker 3, State Highway 48 to Capitan, and State Highway 37 to Highway 380 and Ski Apache. Shelters: First Baptist Church on Country Club Road, Church of Christ on Sudderth Road in Ruidoso, and Trinity Baptist Church in Capitan. Pets and livestock may be taken to J&J Country Church in Ruidoso, or the fairgrounds in Capitan. The blaze is 0% contained, and is aided by air temps of 82ºF, relative humidity of less than 6 percent, and westerly winds of 20mph. Colorado. The High Park Fire, located approximately 15 miles west of Fort Collins, was sparked Saturday June 9th and has consumed more than 20,000 acres (~ 31 sq miles; 81km²); the blaze continues to grow rapidly. The blaze has a HIGH growth potential among areas of rough terrain and beetle killed trees. The fire has damaged or destroyed at least 2 dozens structure, threatening many more. New evacuation order for the area south of County Road 38E from Gindler Ranch Road west to Milner Ranch Road (325 notifications). This area is located south and west of the Horsetooth Reservoir inlet. The High Park Fire is moving rapidly in this direction, Inciweb reported. Crystal Mountain area including Crystal Mountain Road and the Upper Buckhorn. The burning pattern of High Park Fire could potentially cut off exit routes for residents in this area and they should leave now (24 notifications). Any residents who have not already left the Crystal Mountain Area must now evacuate to the west on Buckhorn Road. County Road 27 is no longer passable so evacuation to the east is impossible. Evacuations have been ordered for Stove Prairie Road north along County Road 27 to Highway 14, east along Highway 14 to approximately mile marker 111, southeast to Rist Canyon Fire Station 1, then back west to to include Wilderness Ridge Way, Rist Creek Road, Spring Valley Road and County Road 41 and all of the roads that run off of it. All of Rist Canyon (west of 27E) and all roads off of it, including Whale Rock Road and Davis Ranch Road. South 3 additional miles on County Road 44H to just north of Stringtown Gulch Road. At 11:10 P.M. an evacuation alert has been sent to the Poudre Park (along Highway 14) area from mile marker 111 to mile marker 118. Additionally Highway 14 from Ted’s Place to Stove Prairie is closed, as well as Stove Prairie Road and Rist Canyon. Additional evacuations as of approximately 5 a.m. Sunday include all residents from County Road 27E to Bellvue and for the area south and west of Bellvue, including Lory State Park and Red Stone Canyon, and Buckhorn Road from Masonville up to Stove Prairie School. Evacuation ordered for CR 29C and McMurry Ranch Road (33 notifications). Approximately 2,200 notifications (contacts, not residents) have been sent for evacuations on this fire. New Mexico’s Gov. Martinez has already declared state of emergency in Catron County, where the largest wildfire in state’s history, Gila National Forest wildfire (Whitewater Baldy Complex fire), has consumed about 280,000 acres, with 37% contained. The fire is currently aided by air temps of 86ºF, relative humidity of less than 7 percent. Wyoming. A wildfire in Wyoming’s Guernsey State Park has consumed ABOUT 4,000 acres and forced the evacuation of up to 1,000 campers and visitors, AP reported. Arizona. Gladiator – 16,240 acres – Prescott National Forest – 45% contained. California. George Bush Fire – 1,707 acres – George Bush Tree/Golden Trout Wilderness – Sequoia National Forest – 85% contained. Colorado. Little Sand – 8,238 acres – San Juan National Forest – 13 miles NW of Pagosa Springs – 30% contained. Utah. Box Creek Fire – 5 miles west of Greenwich – 2,018 acres – 75% contained. Utah. Lost Lake Fires – 2,076 acres – Fishlake National Forest – 55% contained. Wyoming. Cow Camp Fire – 8,493 acres – Medicine Bow – Routt National Forest – 20 Miles NE of Wheatland – 70% contained. China. Extreme rain events in southern China have left large parts of Jiangxi, Hunan and Guizhou provinces submerged affecting millions of people. Thousands of homes have been damaged or destroyed. Tens of thousands of hectares of crop have been destroyed. Flooding in Hunan province triggered massive landslides blocking major railroads, including Hukun Railway, which connects Shanghai and Kunming, capital of southwest China’s Yunnan Province, a report said. The authorities reported about a dozen dead or missing. Hindu Kush, Afghanistan.Two earthquakes measuring 5.4 and 5.7Mw struck Hindu Kush region of Afghanistan, about 175km north of Kabul. The quakes destroyed dozens of homes in Dara Azara, a remote village in the Baghlan province, burying about 100 people in the rubble, reports said. The graph, updated weekly, shows as individual points daily mean CO2 up to and including the week (Sunday through Saturday) previous to today. The daily means are based on hours during which CO2 was likely representative of “background” conditions, defined as times when the measurement is representative of air at mid-altitudes over the Pacific Ocean. That air has had several days time or more to mix, smoothing out most of the CO2 variability encountered elsewhere, making the measurements representative of CO2 over hundreds of km or more. The selection process is designed to filter out any influence of nearby emissions, or removals, of CO2 such as caused by the vegetation on the island of Hawaii, and likewise emissions from the volcanic crater of Mauna Loa. The weekly mean (red bar) is simply the average of all days in the week for which a background value could be defined. The average standard deviation of day to day variability, calculated as the difference from the appropriate weekly mean, equals 0.38 ppm for the entire record. 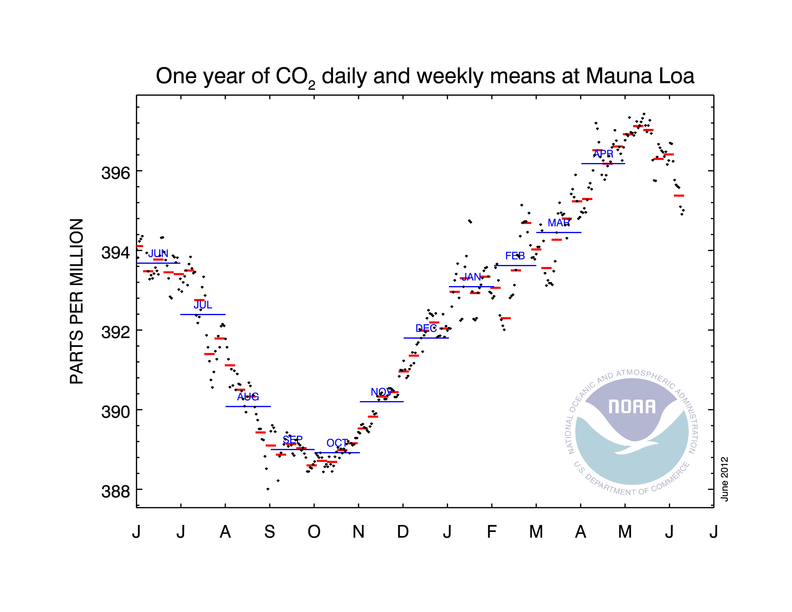 As a visual aid, the blue lines present monthly means of background data as they are presented under Recent Monthly CO2 at Mauna Loa. PDF Version. ESRL/Mauna Loa Global Monitoring Division. Drought is wreaking havoc across Central, South and East China. Many of the vast regions lakes, stricken by the worst drought in living memory, have dried up affecting tens of millions of people and millions of their livestock. There’s no prospect for early rain, forecasters say. The drought that has affected 35 million people across 5 provinces in the middle and lower reaches of the Yangtze River, according to the country’s Meteorological officials. “Among them, about 4.23 million are experiencing difficulties in finding drinking water and 5.06 million are in need of assistance,” said a report. “China’s two largest fresh water lakes – Dongting Lake in Hunan and Poyang Lake in Jiangxi – are both drying up dramatically and, by Friday, 34.83 million people had been affected in the five provinces, the ministry said, citing reports from local civil affairs departments.” The report added. The drought has affected about 4 million hectares (10 million acres) of crops, pushing up the vegetable prices by “19 percent from May 23 to May 27,” according to the Baishazhou Market in Wuhan, capital of drought-hit Hubei in Central China.” The report added. Dried lake near Shijiao town of Qingyuan City, south China’s Guangdong Province. (Xinhua/Li Zuomiao). Image may be subject to copyright. The central government has ordered the Three Gorges Dam on the Yangtze River to discharge more water to help irrigate some of the drought stricken croplands downstream; however, the dam will run out of water if there is no rainfall before June 10, the Three Gorges Corporation has told China Daily.